It’s a fact: Tennis makes people healthier, happier and more social. It also does plenty more. 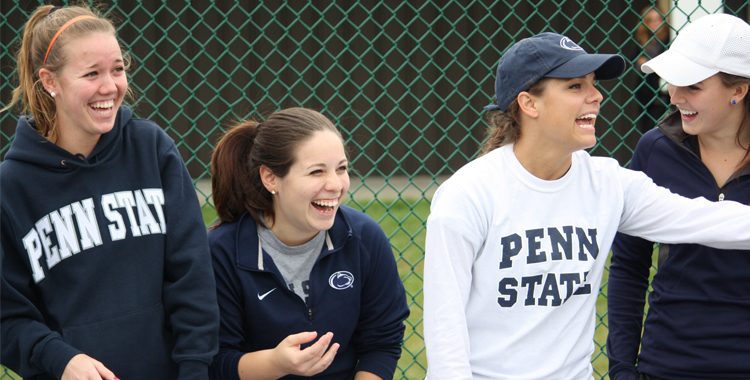 The Penn State University Tennis On Campus team agrees: Tennis is fun. -Scientists at the University of Illinois reported that because tennis requires alertness and tactical thinking, the sport may generate new connections between nerves in the brain, and promote a continuing development of the brain. -According to physician Ralph Paffenbarger, who studied more than 10,000 people over a 20-year period, people who participate in tennis three hours per week cut the risk of death in half from any cause. –Tennis improves one’s ability to accelerate by practice in sprinting, jumping and lunging to move quickly, and helps improve an athlete’s first step by requiring anticipation, quick reaction time and explosion into action. -According to a study by USTA Serves, youth tennis players reported significantly lower rates of suspension from school and other disciplinary measures than participants in other sports, as well as non-athletes. -A study by Dr. Joan Finn and Southern Connecticut State University showed that tennis players scored higher in vigor, optimism and self-esteem while scoring lower in depression, anger, confusion, anxiety and tension than other athletes and non-athletes. -According to Dr. Jim Gavin, author of The Exercise Habit, tennis outperforms golf, inline skating and most other sports in developing positive personality characteristics. – Competitive tennis burns more calories than aerobics, inline skating, or cycling, according to studies on caloric expenditures. -Tennis improves an individuals aerobic fitness by burning fat, improving cardiovascular fitness and maintaining higher energy levels. It also improves an individual’s anaerobic fitness by offering short, intense bursts of activity during a point, followed by rest which helps muscles use oxygen efficiently. Thanks to Jack L. Groppel, Ph.D., for his original article on USTA.com.